The Nova Scotia government's crackdown on treasure hunters won't do anything to protect the province's cultural artifacts, a salvage diver said Wednesday. 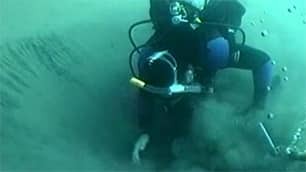 Duane Dauphinee, who has worked all over the world both as an underwater archaeologist and treasure salvager, said that when the government claims everything found, it encourages cheating. "You're not going to stop inquisitive sport divers," he said. "And if they find things, now that they know that the government will take it if they mention it, nothing will be mentioned — it'll go underground. " The Treasure Trove Act will be radically changed by the end of the year, making all historic artifacts government property. The current law divides the spoils 90 per cent to the treasure hunter, and 10 per cent to the province. That means only some of the treasure recovered from Nova Scotia ship wrecks wind up on display in local museums. But Dauphinee said that putting an end to treasure hunting will result in a greater cultural loss in the long-term because the province can't afford the multi-million dollar cost of under-sea recovery work. Without the marriage between archaeology and treasure hunting, Dauphinee said that treasure and history alike will stay forgotten on the ocean floor. Jeff MacKinnon said the decision could spell the end of his treasure salvage company — Sovereign Marine Explorations Associates International. "I think it was careless on the part of the minister of natural resources," he said. "I don't think he looked at the economic impact. I don't think that he took the time to sit down and discuss it with us." But, the province believes it's important to keep all historic items, including treasure, inside Nova Scotia. "People can still do underwater heritage research," Mike MacDonald, executive director of the mineral resources branch of the Natural Resources Department, said. "But any of the material that's found would be considered to be artifacts, and would be the property of the Crown." Michael Noonan, with the provincial Department of Tourism, Cultural and Heritage Department, said it's important to protect the province's marine heritage.